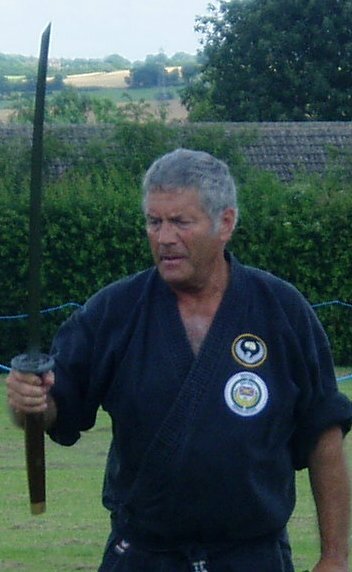 The British Go-Dai Association was formed in 1980 by the Chairman, Sensei Duncan Hardy, 7th Dan Karate (pictured right with his Samurai katana). Sensei Duncan keeps a watchful eye on students to ensure that standards are maintained throughout the Association. Known for his fundraising efforts by promoting the martial arts, past demonstrations have brought him in touch with Henry Cooper and other celebrities. In the year 2000, he set another world record, by having 30 breeze blocks smashed on his chest. He has walked from John O'Groats to Land's End barefoot for charity and knocked down a house in Worksop with his bare hands! We are proud of our roots with traditional teaching methodologies; there is no such thing as a 21 year old 5th Dan in our Association! We do not give black-belts away, so if you want to wear a black-belt after training for a couple of years, our best advice is to go and buy one from your local sports shop! We do offer a Dan grading once per year, for students who have been nominated for Dan grade eligibility. All black-belts have been trained to the highest standards and we are proud to have some of the most qualified instructors in the area who train and teach students with total dedication to their martial art.